I’m having to part with a wheel, folks, the Kromski Polonaise. It’s for sale here. 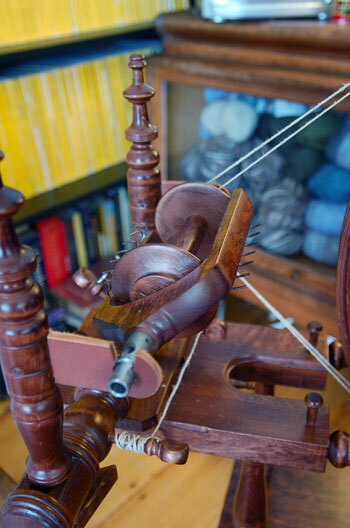 I love her, but I’ve found that spinning on the couch allows me to spin comfortably for a massive amount of time, and it works out better if I treadle with both feet. 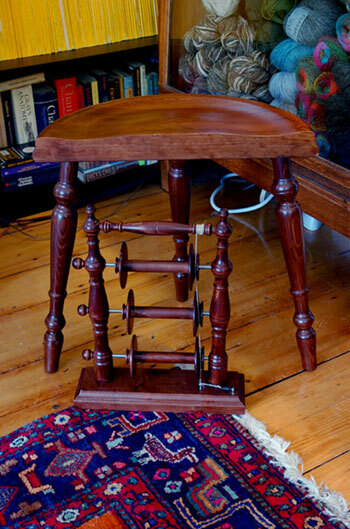 The wheel is pristine, comes with 4 bobbins, a tensioned lazy kate, and matching stool (the stool has a couple of nicks to the finish). $475 + $6 shipping. I’m only shipping this within the US. If you can pick her up here in Boston, I’ll knock some off the price. 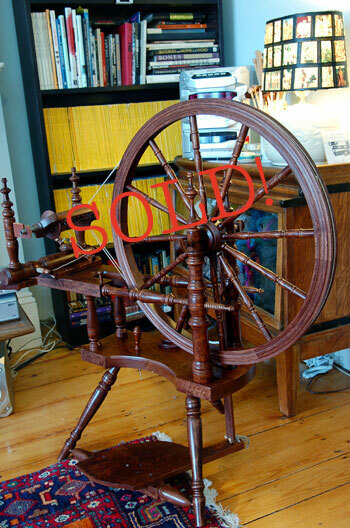 ETA: Someone’s coming to see her, so I’ve taken down the sale page. If you’d like to be notified if she doesn’t sell, comment and let me know. Oh, this is awfully tempting. The possibilities for reenacting. Oh my. She’s beautiful! If only I could offer here a home here… I’m sure whoever snatches her up will love it! So, what wheel are you hoping to get next? Are those lots of National Geographics in the background? I love reading those. Details, please! (Like, is she still available? And what is she? I don’t recognize her exactly). Lovely…. Oh gosh, what a beautiful wheel! I showed it to my husband after oohing and aahing over the picture, casually saying “It’s for sale” and he just said “Uh oh.” Too bad I really can’t justify it. I hope she finds a nice new home soon! so has she found a home yet? no, not with me. as pretty as she is, i don’t have the room or the house for a wheel just for show. i like me the double treadles too. and i’m saving up for a victoria anyway. What kind of wheel is she? What is her wheel diameter? What kind of wheel is she? She looks like a Norwegian. What is her wheel diameter?